Firetrucks Unlimited has a variety of high quality new and used fire apparatus & equipment for sale. Our experienced team is always available to answer your questions. Contact us today if you need assistance with your next fire apparatus or equipment purchase. Browse our inventory of high quality used fire trucks for sale. 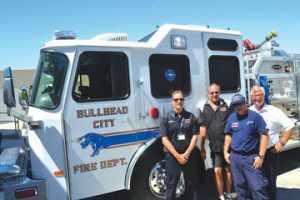 Our inventory includes used pumpers & engines, used ladder trucks & aerials, used fire tankers & water tenders, used ambulances & rescue trucks, used wildland vehicles and used ARFF trucks. We manufacture brush trucks which are customized for your specific needs. Our type 6 brush trucks are quick, tough and effective and are an essential tool when facing challenging situations. Browse our inventory of used fire truck equipment including used fire truck engines, used fire pumps, fire fighting nozzles and more. We can help you sell your used fire apparatus! We will list and advertise your used fire truck to thousands of fire departments for free! Once we find a buyer, we will handle all of the paperwork to transfer your title. We are partnered with Leasing 2 to offer fire truck financing to our customers. Leasing 2 can help your department get the used fire apparatus you need.